One iteration of the "cosmic welcome mat" developed by experimental philosopher Jonathon Keats, in consultation with space archaeologist Alice Gorman. The mats are designed to let aliens know they are welcome here on Earth. Maybe E.T. has just been waiting for an invitation. That potential solution to the Fermi Paradox is getting a test this week, with the debut of a suite of "cosmic welcome mats" designed to let intelligent aliens know that Earth is happy to receive them (as long as they wipe their tentacles first, of course). Previous missives to E.T. have generally included a fair bit of information about ourselves. For example, the golden plaques affixed to NASA's Pioneer 10 and Pioneer 11 probes, the Golden Record flying aboard the twin Voyager spacecraft, and the radio message beamed toward a distant star cluster in 1974 by Puerto Rico's Arecibo Observatory all sought to let aliens know what we look like, among other things. Such communiques may be too complicated (and too self-centered) to really draw aliens in, said experimental philosopher Jonathon Keats, who developed the welcome mats with Flinders University space archaeologist Alice Gorman. So they aimed for simple. "I think 'Welcome' is the simplest message of all," Keats told Space.com. You can't assume journeying aliens will speak English, or any other human language, so he and Gorman didn't just grab a stack of mats off a Walmart shelf. Instead, they came up with their own design, which features an amorphous red blob against a blue-and-purple background. 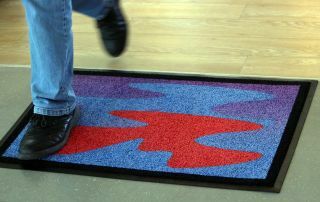 The mats communicate "welcomeness" in a similarly abstract way. There are four different versions of the basic design, and all mean to convey spatially that the blob fits in well with its surroundings, Keats said. In addition, two of the designs evoke a biochemical reaction, with the blob/alien "agonist" slotting nicely into a "receptor." A third version shows that the blob has room to grow, and the fourth features multiple blobs, suggesting that aliens of all kinds are welcome, Keats said. These data will inform future iterations of the mat, which Keats hopes go global and beyond. He'd like to get one on the doorstep of every person on the planet, as well as aboard the International Space Station, he said. Whether or not the mats persuade E.T. to step in for a drink, Keats said he would like the project to inject a little bit of invitingness into what he sees as an increasingly xenophobic world. "My core audience is everybody," he said. "We're all aliens."